With the Olympics just around the corner, it's no suprise that sport luxe will be a key trend for 2012. But this isn't akin to the dire sportwear trend instigated by Spice Girl Mel C in the 1990s, 2012's interpretation is sophisticated and chic; think subtle sporty details in the form of zips, go-faster stripes and performance-wear inspired panelling. 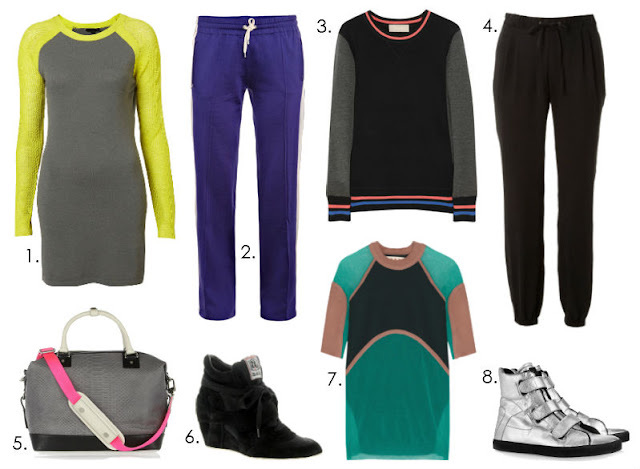 So to get you started, here's my pick of the sports-luxe pieces that are definitely worth sprinting to the shops for. 1. Knitted Mesh sleeve dress, Topshop, £46.00. 2. Isabel Marant Uden track trousers, Matchesfashion.com, £330.00. 3. Jason Wu Varsity wool sweater, Net-a-porter.com, £950. 4. NW3 Hayle trouser, Hobbs, £23.00. 5. Diane Von Furstenberg Sporty-Drew tote, Net-a-porter.com, £660. 6. Ash Bowie wedge trainers, ASOS, £149.00. 7. Marni paneled sweater, The Outnet, £252.50. 8. Karl metallic leather high-tops, Net-a-porter,com, £295.